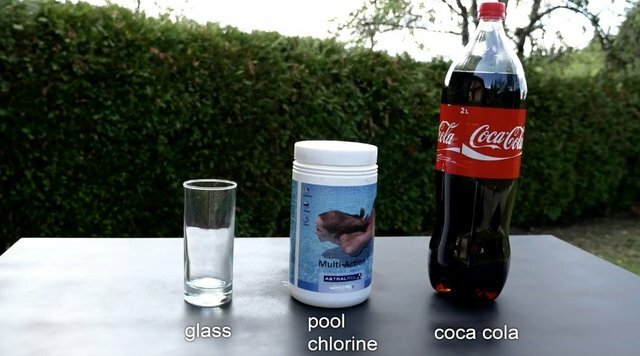 Quick & Fun Experiments: Coca Cola & Chlorine! Today we are back with yet another easy and quick experiment. There are many experiments with coke and today we are gonna learn more about the coke and pool chlorine experiment. & for this experiment, there aren't any specific measurements, you are basically just eyeball it. Pour coke into a glass container. Add chlorine to the coke. Once you've done that you'll notice that it will begin to turn white and bubble up and next is the eruption! One of the ingredients in coke is phosphoric acid and chlorine has calcium hypochlorite, so when the two come in contact with each other, they set off a chemical reaction that makes a small explosion! Although this experiment is exciting and fun to witness, it is recommended that you conduct this experiment outside because it releases poisonous chlorine gas.